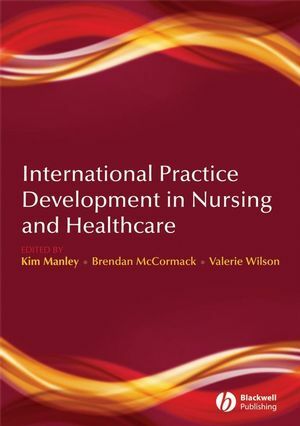 International Practice Development in Nursing builds on Practice Development in Nursing, edited by the same editors and is the first book to develop a truly international practice development perspective. Practice development is a key concept in developing effective nursing care which is firmly embedded in health service modernisation agendas, clinical governance strategies, team and cultural developments and in quality improvements that directly impact on patient care in the UK and internationally. Practice development acknowledges the interplay between the development of knowledge and skills, enablement strategies, facilitation and a systematic, rigorous and continuous processes of emancipatory change in order to achieve evidence-based, person-centred care. International Practice Development in Nursing is an essential resource for all practice developers and for nurses with a remit for facilitating innovation and change in practice. Professor Kim Manley is Head of Practice Development, Royal College of Nursing. Professor Brendan McCormack is Professor of Nursing Research/Director of Nursing research and Practice Development, Nursing Research Institute, University of Ulster & Royal Hospitals Trust, Belfast. Adjunct Professor of Nursing, Monash University, Melbourne, Australia. Rob Garbett is Research Fellow, Nursing Research Institute, University of Ulster & Royal Hospitals Trust, Belfast. Kim Manley, Brendan McCormack, Val Wilson. Chapter 2: Person-centred Systems and Processes. Brendan McCormack, Kim Manley and Ken Walsh. Chapter 3: The ever-changing discourse of practice development: Can we all keep afloat?. Lucienne. Hoogwerf, Donna. Frost and Tanya McCance. Chapter 4: A methodological walk in the forest: critical creativity and human flourishing. Angie Titchen & Brendan McCormack. Chapter 5: Evidence use and evidence generation in practice development. Tracey Bucknall, Bridie Kent, Kim Manley . Chapter 6: Learning – the Heart of Practice Development. Charlotte Clarke & Val Wilson. Chapter 7: An Exploration Of Practice Development Evaluation: Unearthing Praxis. Val Wilson, Sally Hardy, Bob Brown. Chapter 8: Enabling Practice development: delving into the concept of facilitation from a practitioner perspective. Theresa Shaw, Jan Dewing, Ros Young, Margaret Devlin, Christine Boomer and Marja Legius. Chapter 9: Being Culturally Sensitive in Development Work. Cheryle Moss & Jane Chittenden. Chapter 10: Person-centred outcomes and cultural change. Brendan McCormack, Tanya McCance, Paul Slater, Joanna McCormick, Charlotte McArdle and Jan Dewing. Chapter 11: Changing the culture and context of practice: Evaluating the Journey Towards Family-Centred Care. Chapter 12: Becoming a Facilitator – the journey. Shirley Burke, Helen O’Neal and Jacqueline Clarke. Annette Solman & Mary FitzGerald . Chapter 14: Becoming and Being Active Learners and Creating Active Learning Workplaces: The Value of Active Learning in Practice Development. Chapter 15: Evidence use in practice development. Rob McSherry and Karen Cox. Chapter 16: Using Practice Development approaches in the development of a.
Liz Henderson and Sandra McKillop. Chapter 17: Accrediting Practice Development Activity: an approach for achieving person-centred and evidence-based care. Kim Manley, Jane Canny, Jill Down ,Jane-Marie Hamill, Elaine Manderson, Natalie Moroney, Jenny Newton, Alyce Schultz, Helen Young. Chapter 18: The Future Contribution of Practice Development in a Changing Healthcare Context.